The day after Umair's grandfather died, the seven-year-old saw his little sister dragging their grand- father's bolster across the living room towards him. Something snapped in him. "This is not your toy! It was Grandpa's favourite bolster," he screamed at her until she wailed in fear. That was the bolster Umair, now nine, had used to prop up the legs of his grandfather whenever they swelled during the latter's year- long battle with kidney cancer. His grandfather died two years ago. Umair did not know that it was his mother who had asked his sister to take the bolster to him for comfort as she knew he missed his grandfather terribly. This is one of the many episodes captured in a new children's book about how kids cope with grief. Titled P.S. Grandpa, I Love You, the book will be launched by HCA Hospice (Care) to help children better deal with bereavement as part of the Asian Festival of Children's Content to be held at the National Library Building this weekend. Some 15,000 copies of the book have been printed and will be distributed to schools and the children of patients from HCA Hospice. 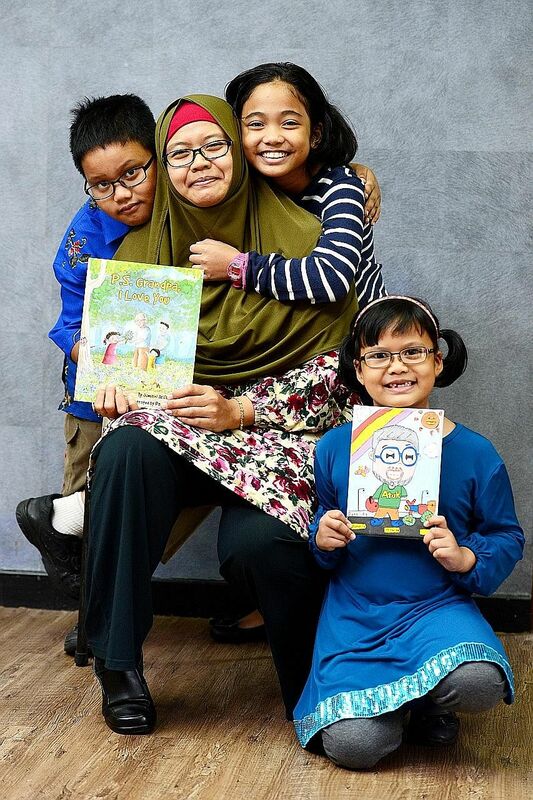 The book is written by children's book author Jumaini Ariff, 37, who shared how her father's death affected her two children as well as her niece and nephew. Umair is her son. Ms Jumaini said: "I wanted to write the book because I was broken after my father's death and sometimes took it out on the children. Yet, as I observed how they struggled to cope and deal with the loss, I realised that they also need help and there are so many ways we can learn from them." In the book, she recounted how her then four-year-old daughter had busied herself with drawing pictures of her grandfather smiling. "All I felt was sorrow and guilt for not being by my father's bedside when he died, so I asked her why she was drawing such pictures and she said it is because he is now free from pain," said Ms Jumaini. "That completely reframed the situation for me and I realised that one way to tackle grief is to look at things from different perspectives and recognise the blessings during such difficult times." HCA Hospice's senior medical social worker, Ms Lola Ng, said the book is the first local book that tackles bereavement from the child's perspective. "It is long overdue because resources for children on this topic are rare," she said. Agreeing, Dr Tan Poh Kiang, president of HCA Hospice, said: "Unfortunately, the manner in which children grieve and handle the loss of their loved ones is less known to us. It is a common sight to see children playing and running around during funeral wakes and ceremonies as if they are unscathed. I wanted to write the book because I was broken after my father's death and sometimes took it out on the children. Yet, as I observed how they struggled to cope and deal with the loss, I realised that they also need help and there are so many ways we can learn from them. "The truth is, they are hurting too. It is just that they have a less-developed psyche and emotional constitution to even understand how they feel and to identify their thoughts or feelings as being part of a normal process of grief." Grief, when not handled properly, say social workers, always causes trouble later. Some may face emotional adjustment, relational issues or do not know how to react to a crisis or loss next time. The book also includes suggested activities to help children express their emotions better and find ways to honour the memory of the dead. Ms Jumaini's children wrote notes to their grandfather, which were put into a box left next to his portrait. They also saved up their pocket money to donate to an orphanage as they could empathise with other children who also did not have their loved ones by their side. Said Ms Jumaini: "We can harness the power that comes with the painful parts of life by channelling the grief to do something purposeful for others."